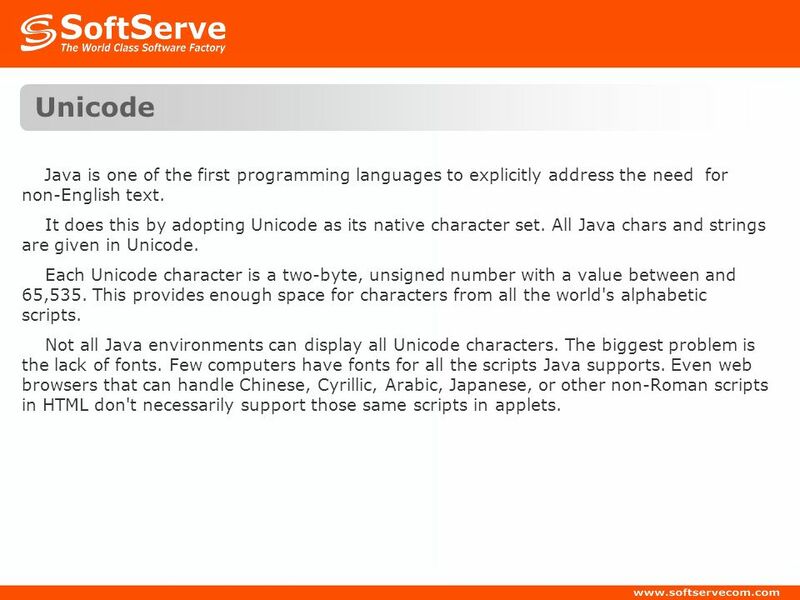 7 Unicode Java is one of the first programming languages to explicitly address the need for non-English text. It does this by adopting Unicode as its native character set. 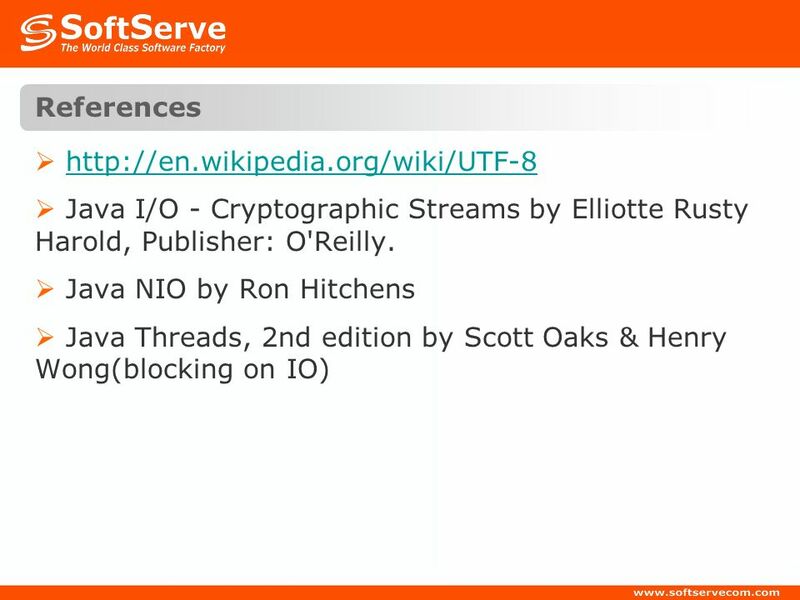 All Java chars and strings are given in Unicode. Each Unicode character is a two-byte, unsigned number with a value between and 65,535. This provides enough space for characters from all the world's alphabetic scripts. Not all Java environments can display all Unicode characters. The biggest problem is the lack of fonts. Few computers have fonts for all the scripts Java supports. Even web browsers that can handle Chinese, Cyrillic, Arabic, Japanese, or other non-Roman scripts in HTML don't necessarily support those same scripts in applets. 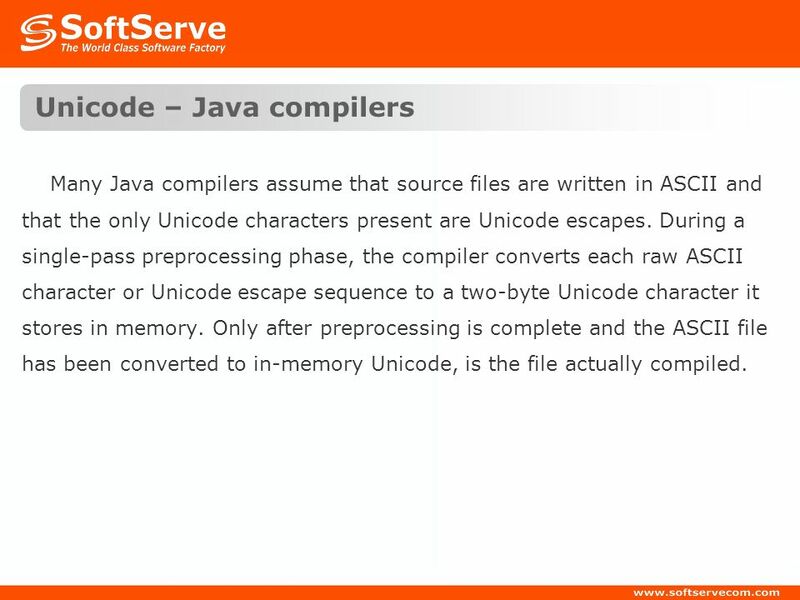 Many Java compilers assume that source files are written in ASCII and that the only Unicode characters present are Unicode escapes. 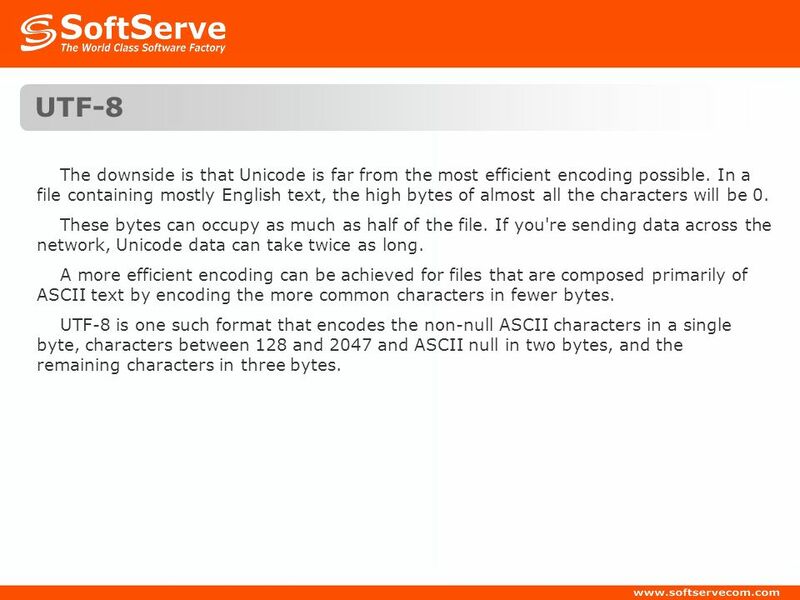 During a single-pass preprocessing phase, the compiler converts each raw ASCII character or Unicode escape sequence to a two-byte Unicode character it stores in memory. Only after preprocessing is complete and the ASCII file has been converted to in-memory Unicode, is the file actually compiled. 9 UTF-8 The downside is that Unicode is far from the most efficient encoding possible. In a file containing mostly English text, the high bytes of almost all the characters will be 0. These bytes can occupy as much as half of the file. If you're sending data across the network, Unicode data can take twice as long. A more efficient encoding can be achieved for files that are composed primarily of ASCII text by encoding the more common characters in fewer bytes. 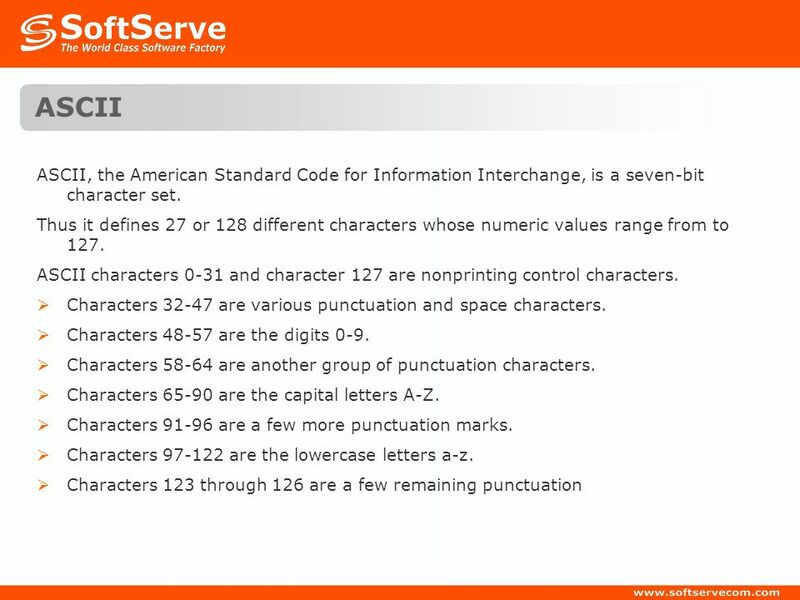 UTF-8 is one such format that encodes the non-null ASCII characters in a single byte, characters between 128 and 2047 and ASCII null in two bytes, and the remaining characters in three bytes. 11 Marking and Resetting public synchronized void mark(int readLimit) public synchronized void reset() throws IOException public boolean markSupported() It's often useful to be able to read a few bytes and then back up and reread them. 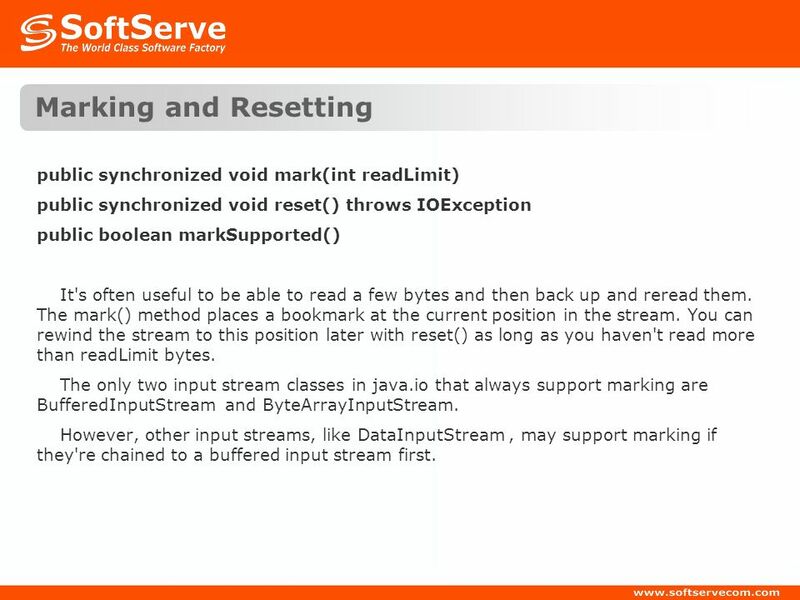 The mark() method places a bookmark at the current position in the stream. You can rewind the stream to this position later with reset() as long as you haven't read more than readLimit bytes. 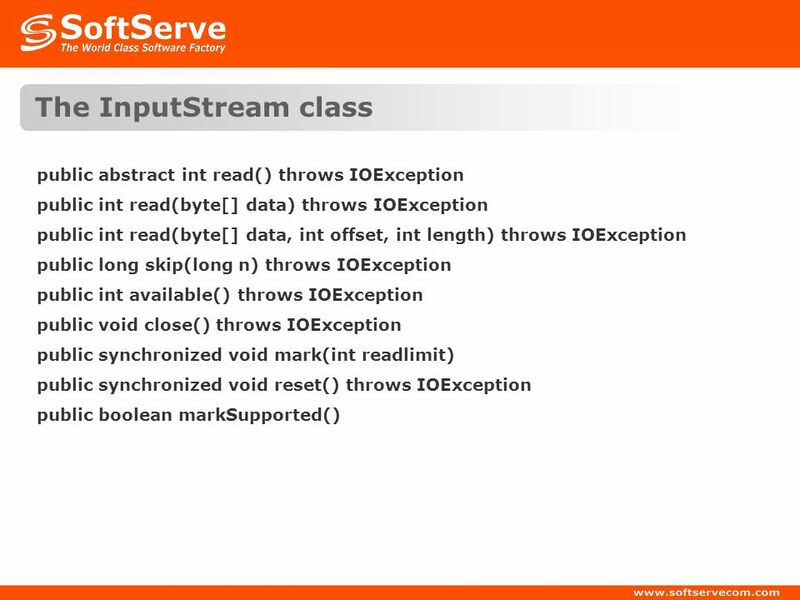 The only two input stream classes in java.io that always support marking are BufferedInputStream and ByteArrayInputStream. However, other input streams, like DataInputStream , may support marking if they're chained to a buffered input stream first. 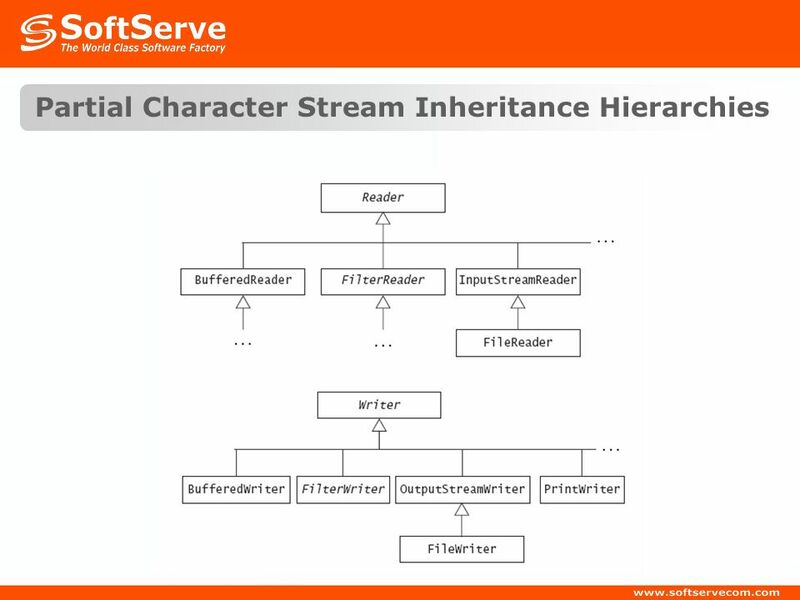 15 Filter Streams Filter input streams read data from a preexisting input stream like a FileInputStream and have an opportunity to work with or change the data before it is delivered to the client program. 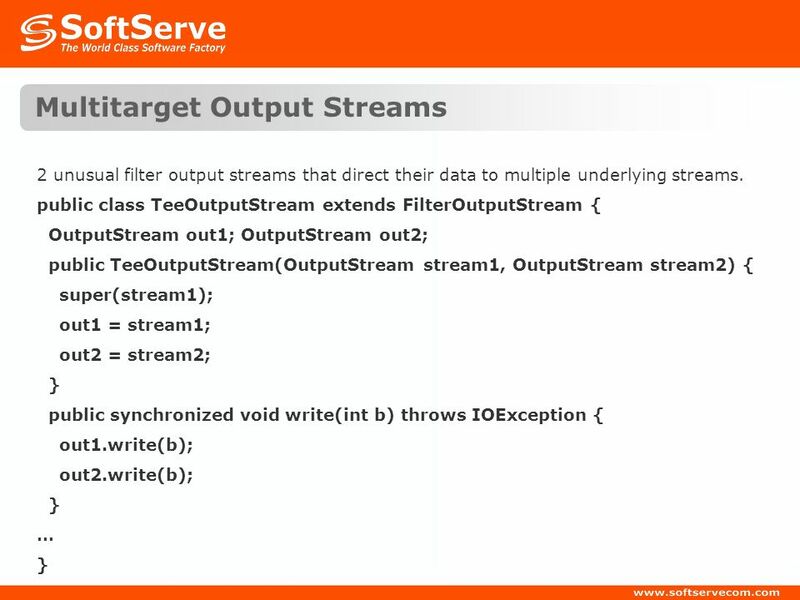 Filter output streams write data to a preexisting output stream such as a FileOutputStream and have an opportunity to work with or change the data before it is written onto the underlying stream. 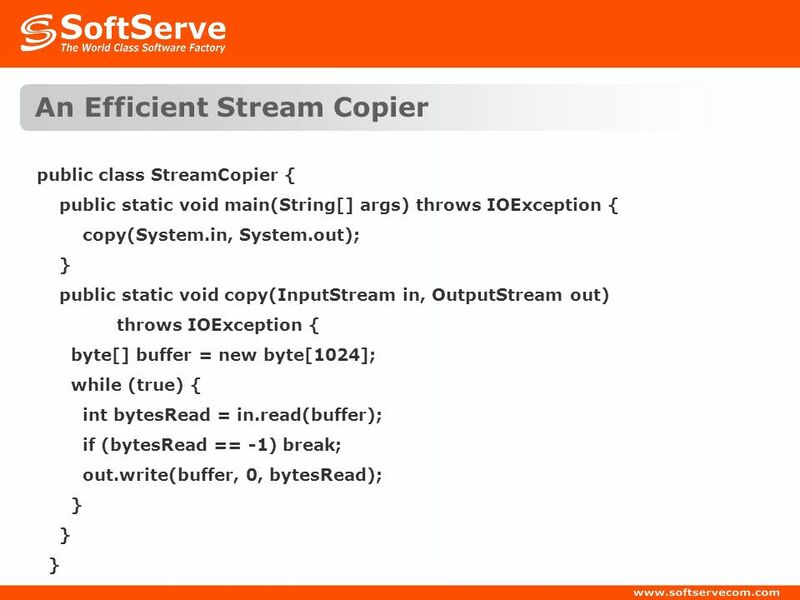 BufferedInputStream and BufferedOutputStream The data is read from or written into the buffer in blocks; subsequent accesses go straight to the buffer. This improves performance in many situations. Buffered input streams also allow the reader to back up and reread data. 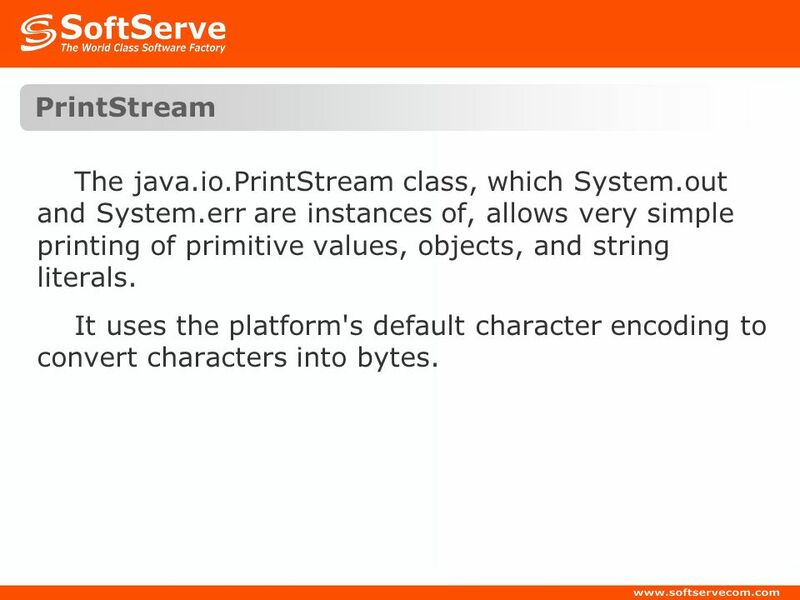 17 PrintStream The java.io.PrintStream class, which System.out and System.err are instances of, allows very simple printing of primitive values, objects, and string literals. It uses the platform's default character encoding to convert characters into bytes. 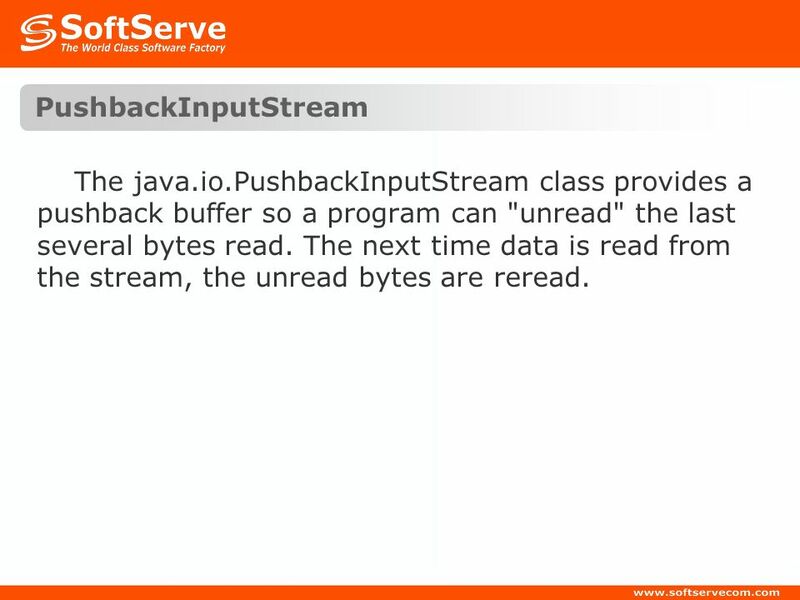 18 PushbackInputStream The java.io.PushbackInputStream class provides a pushback buffer so a program can "unread" the last several bytes read. The next time data is read from the stream, the unread bytes are reread. 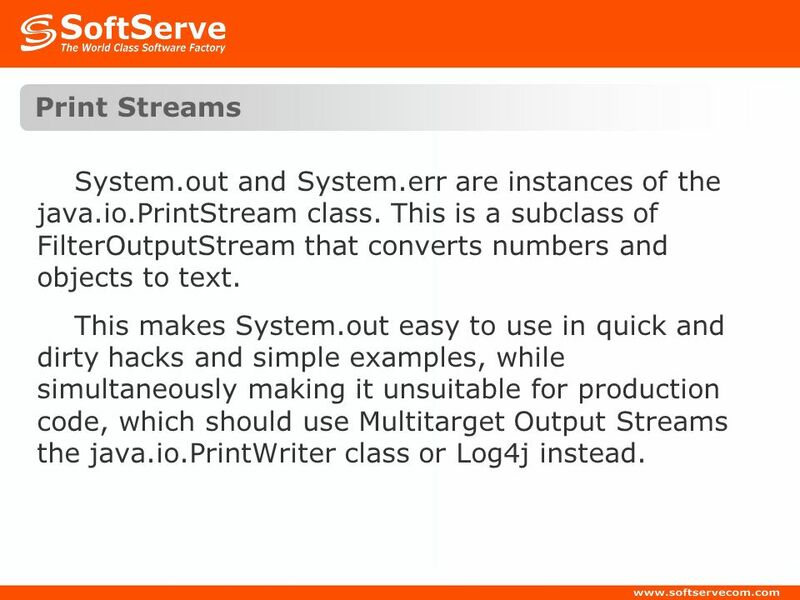 19 Print Streams System.out and System.err are instances of the java.io.PrintStream class. 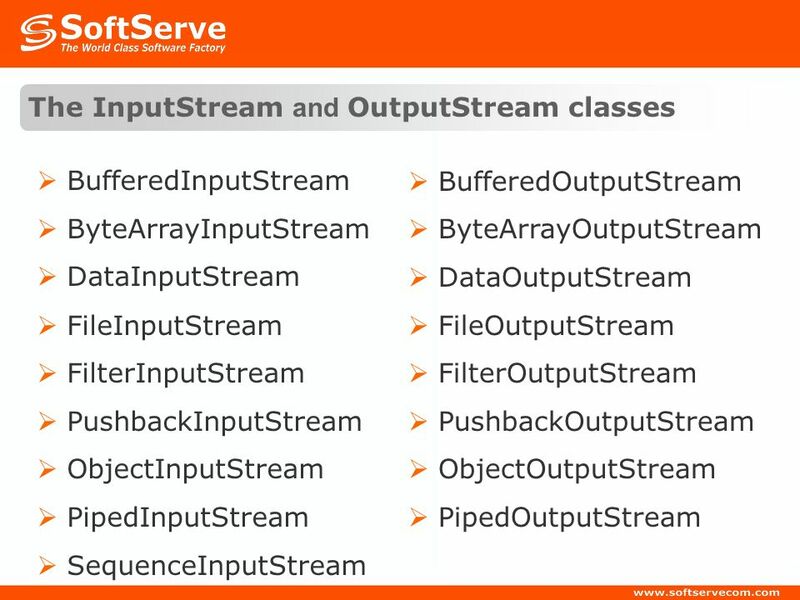 This is a subclass of FilterOutputStream that converts numbers and objects to text. This makes System.out easy to use in quick and dirty hacks and simple examples, while simultaneously making it unsuitable for production code, which should use Multitarget Output Streams the java.io.PrintWriter class or Log4j instead. 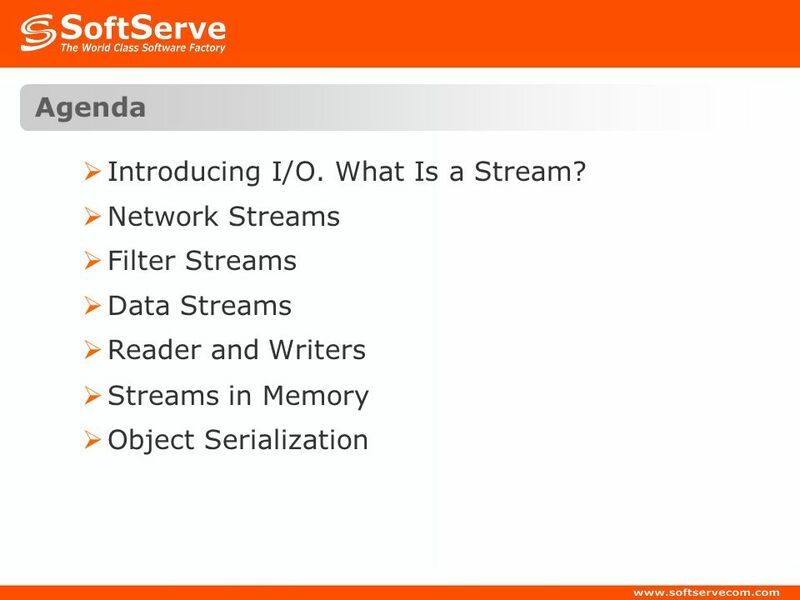 21 Data Streams Data streams read and write strings, integers, floating-point numbers, and other data that's commonly presented at a higher level than mere bytes. 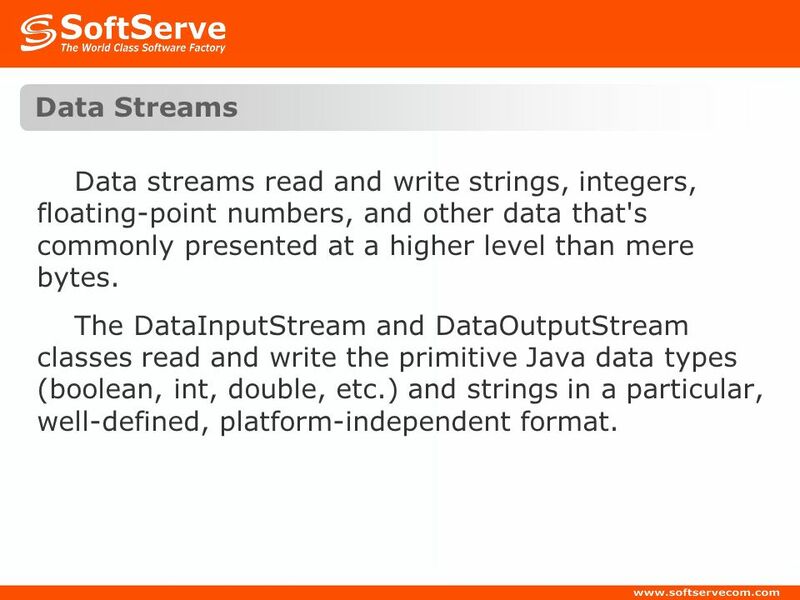 The DataInputStream and DataOutputStream classes read and write the primitive Java data types (boolean, int, double, etc.) and strings in a particular, well-defined, platform-independent format. 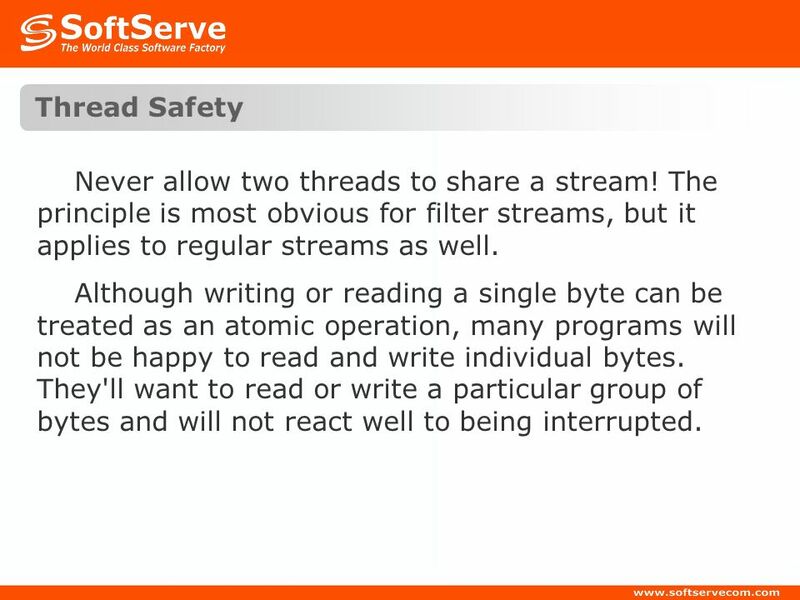 24 Thread Safety Never allow two threads to share a stream! 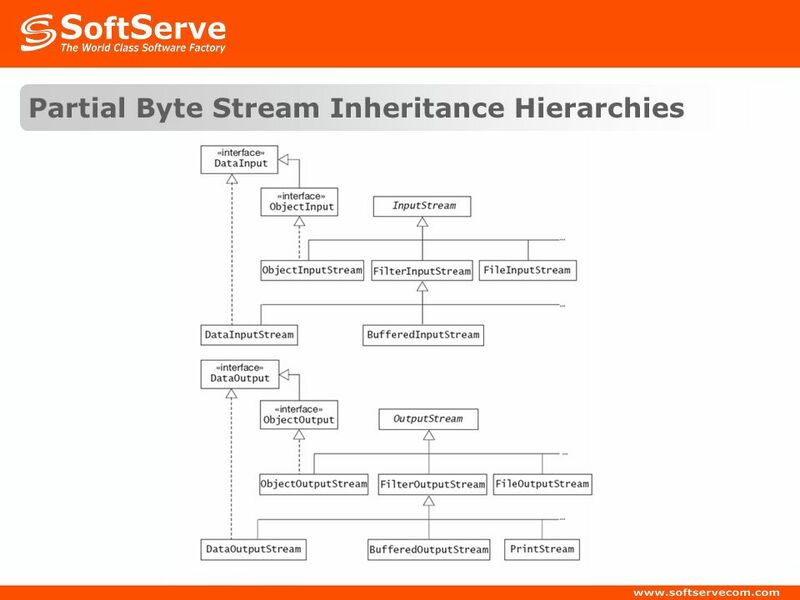 The principle is most obvious for filter streams, but it applies to regular streams as well. Although writing or reading a single byte can be treated as an atomic operation, many programs will not be happy to read and write individual bytes. They'll want to read or write a particular group of bytes and will not react well to being interrupted. 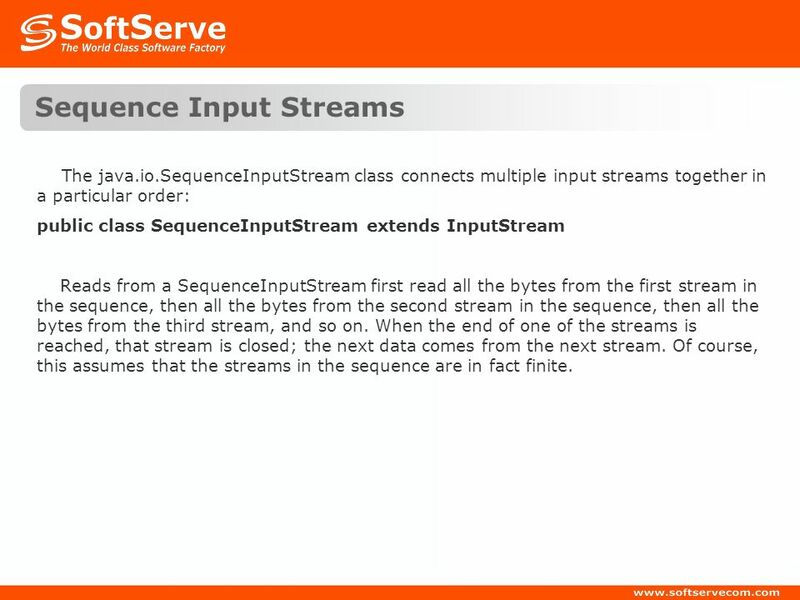 The java.io.SequenceInputStream class connects multiple input streams together in a particular order: public class SequenceInputStream extends InputStream Reads from a SequenceInputStream first read all the bytes from the first stream in the sequence, then all the bytes from the second stream in the sequence, then all the bytes from the third stream, and so on. 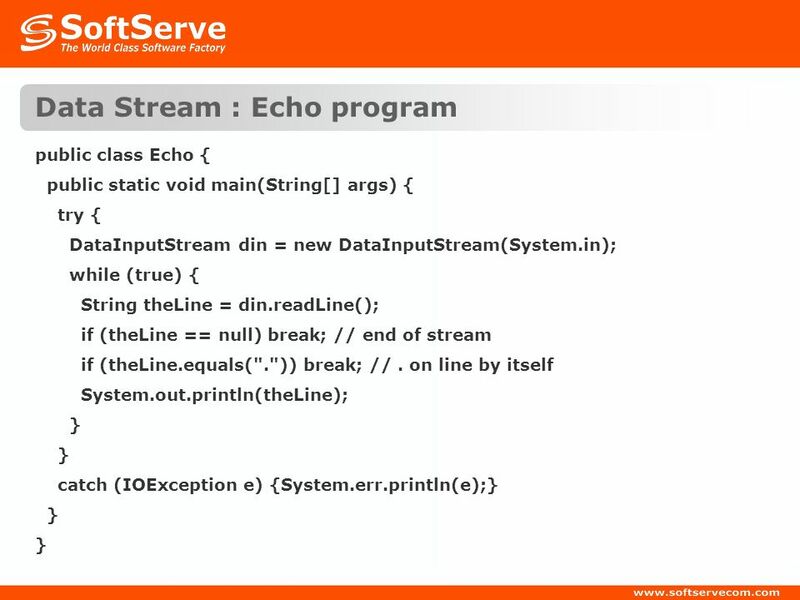 When the end of one of the streams is reached, that stream is closed; the next data comes from the next stream. Of course, this assumes that the streams in the sequence are in fact finite. 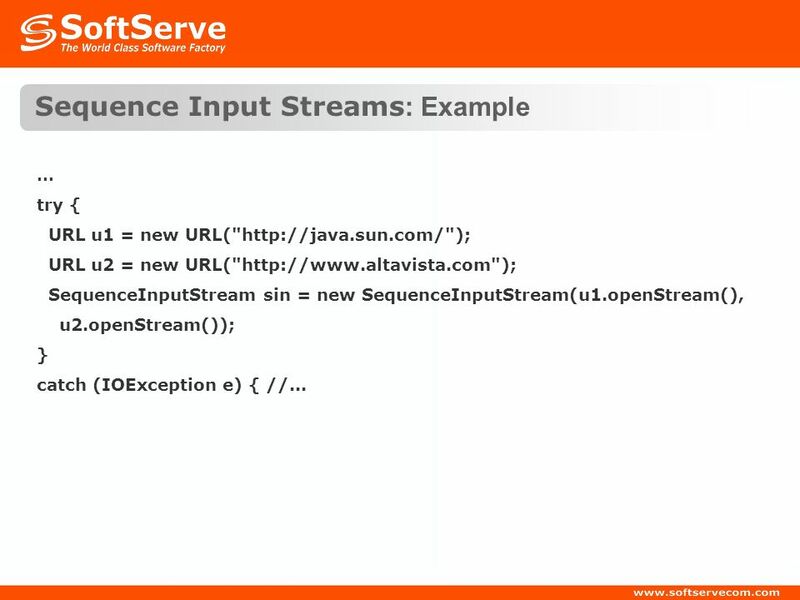 public SequenceInputStream(Enumeration e) public SequenceInputStream(InputStream in1, InputStream in2) The first constructor creates a sequence out of all the elements of the Enumeration e. This assumes all objects in the enumeration are input streams. If this isn't the case, a ClassCastException will be thrown the first time a read is attempted from an object that is not an InputStream. 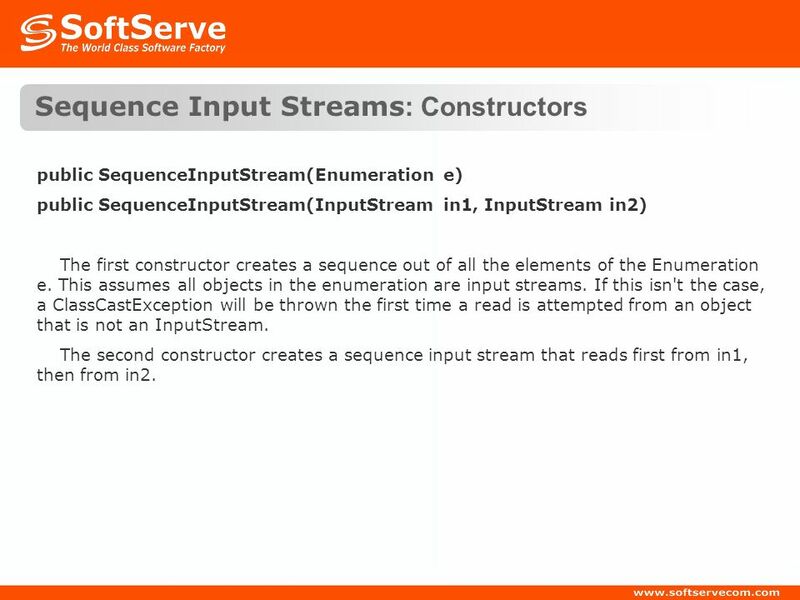 The second constructor creates a sequence input stream that reads first from in1, then from in2. 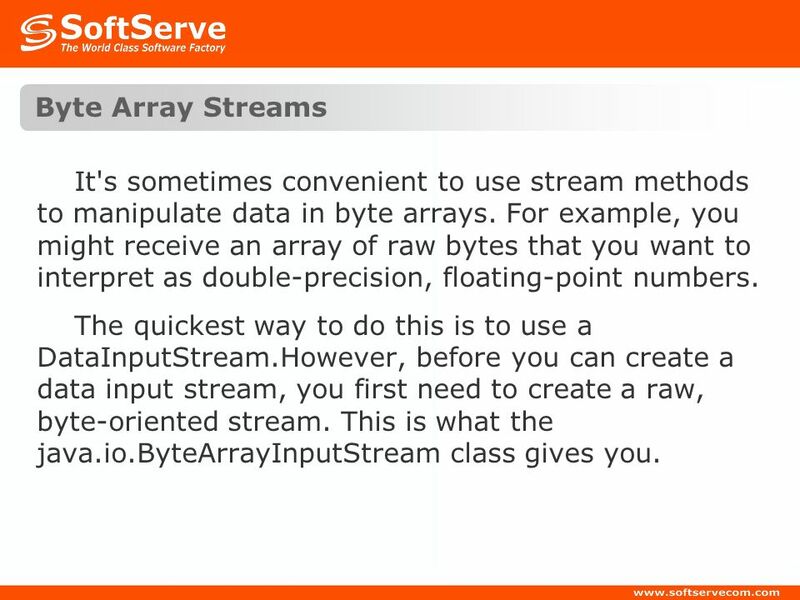 28 Byte Array Streams It's sometimes convenient to use stream methods to manipulate data in byte arrays. For example, you might receive an array of raw bytes that you want to interpret as double-precision, floating-point numbers. 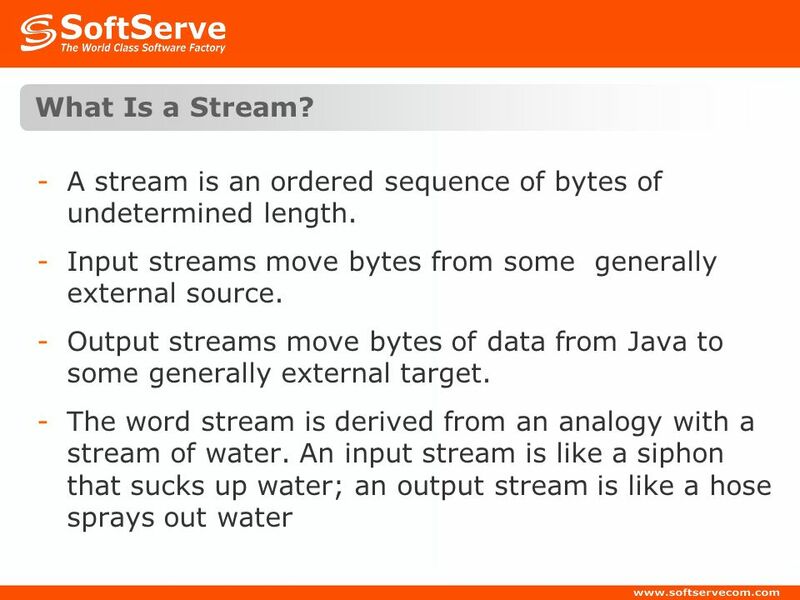 The quickest way to do this is to use a DataInputStream.However, before you can create a data input stream, you first need to create a raw, byte-oriented stream. This is what the java.io.ByteArrayInputStream class gives you. 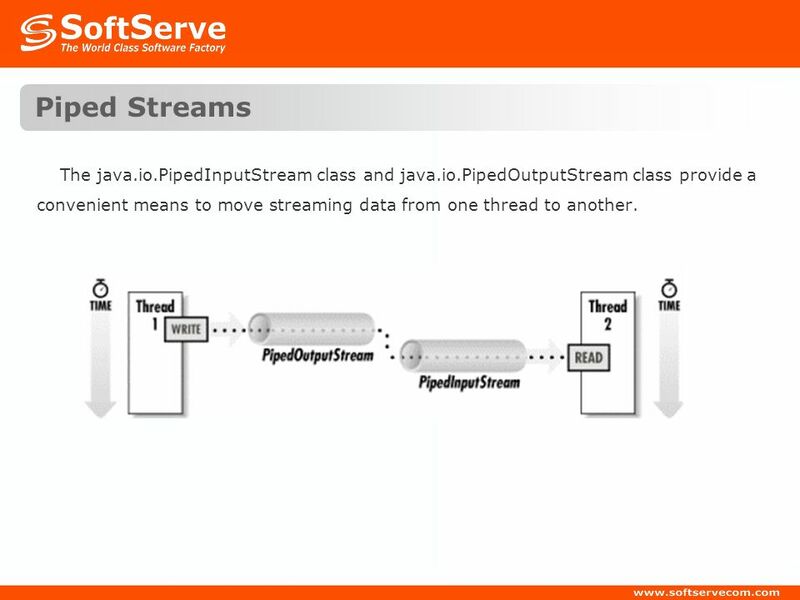 29 Piped Streams The java.io.PipedInputStream class and java.io.PipedOutputStream class provide a convenient means to move streaming data from one thread to another. 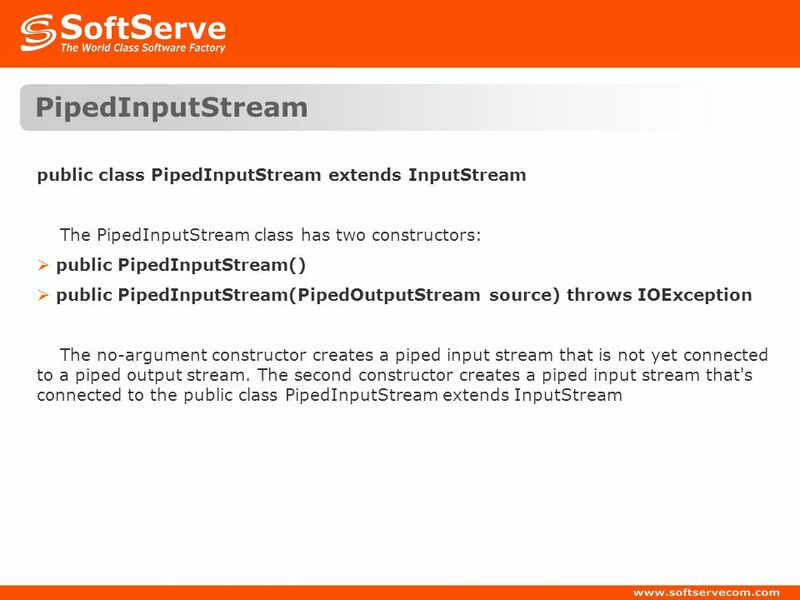 The PipedOutputStream class also has two constructors: public PipedOutputStream(PipedInputStream sink) throws IOException public PipedOutputStream() The no-argument constructor creates a piped output stream that is not yet connected to a piped input stream. 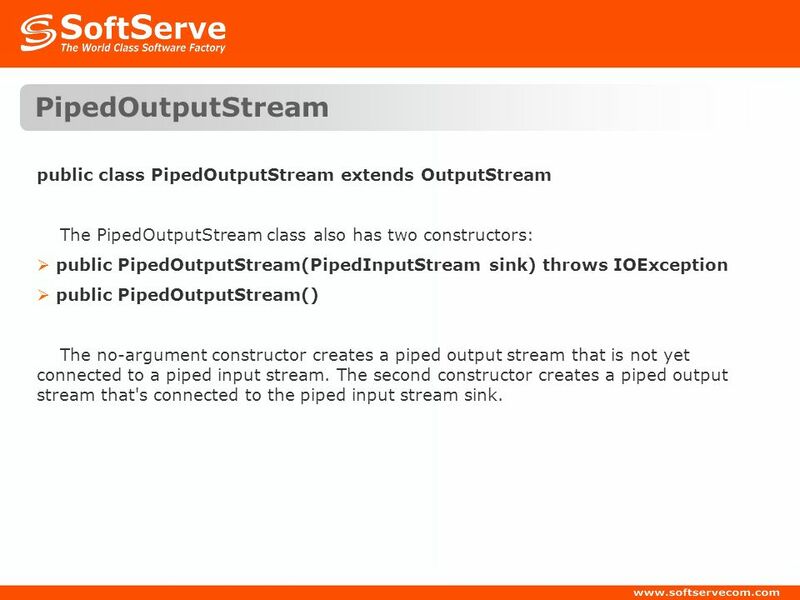 The second constructor creates a piped output stream that's connected to the piped input stream sink. 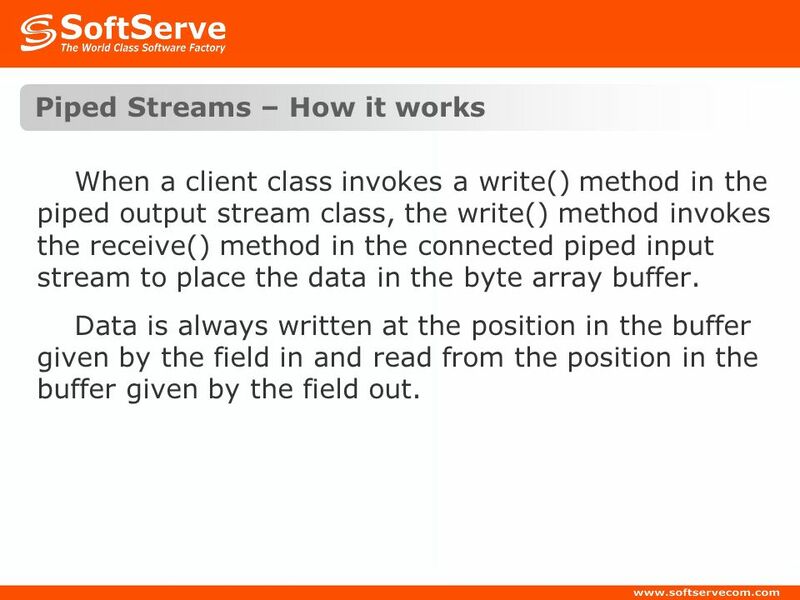 When a client class invokes a write() method in the piped output stream class, the write() method invokes the receive() method in the connected piped input stream to place the data in the byte array buffer. Data is always written at the position in the buffer given by the field in and read from the position in the buffer given by the field out. There are two possible blocking situations here. 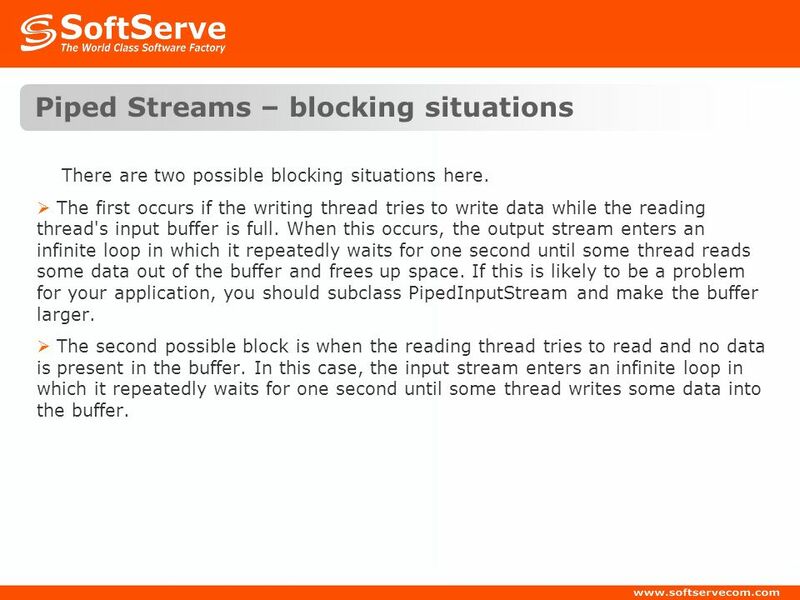 The first occurs if the writing thread tries to write data while the reading thread's input buffer is full. When this occurs, the output stream enters an infinite loop in which it repeatedly waits for one second until some thread reads some data out of the buffer and frees up space. 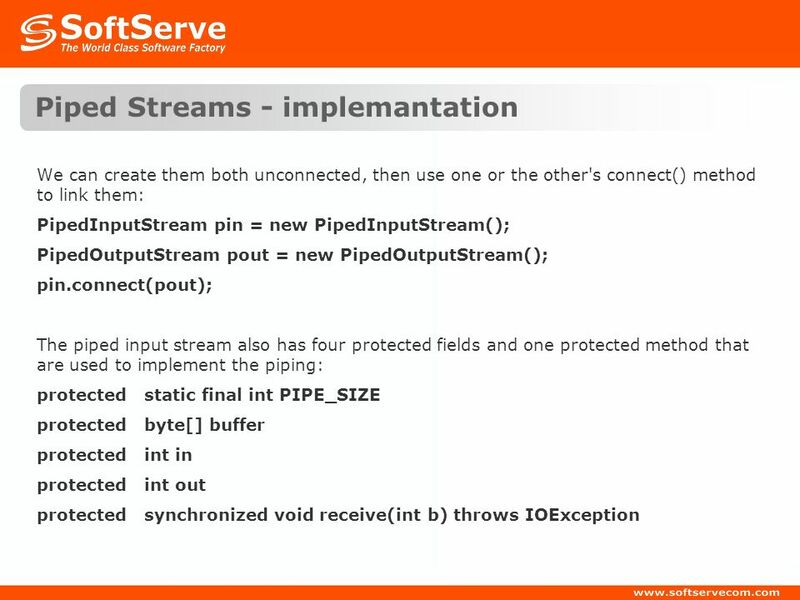 If this is likely to be a problem for your application, you should subclass PipedInputStream and make the buffer larger. The second possible block is when the reading thread tries to read and no data is present in the buffer. In this case, the input stream enters an infinite loop in which it repeatedly waits for one second until some thread writes some data into the buffer. 35 Readers and Writers The difference between readers and writers and input and output streams is that streams are fundamentally byte based, while readers and writers are fundamentally character based. 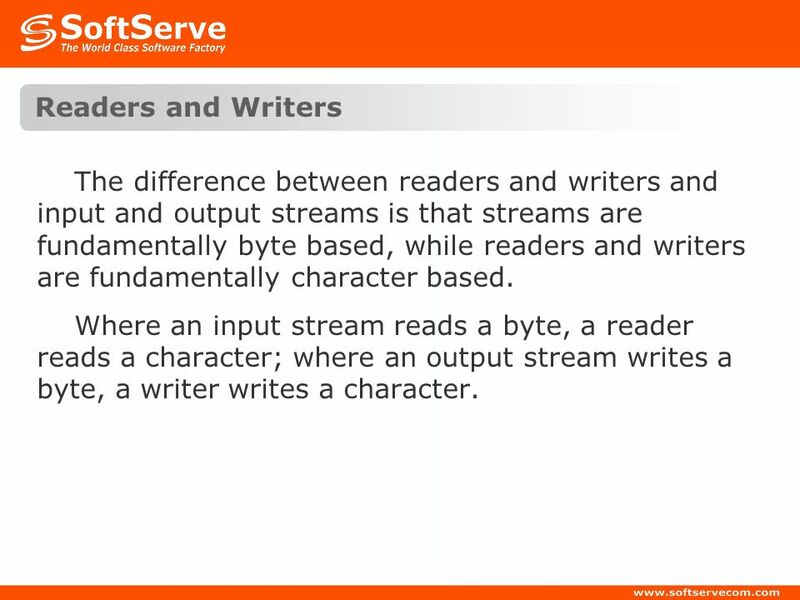 Where an input stream reads a byte, a reader reads a character; where an output stream writes a byte, a writer writes a character. 37 Object Serialization Object serialization saves an object's state in a sequence of bytes so that the object can be reconstituted from those bytes at a later time. 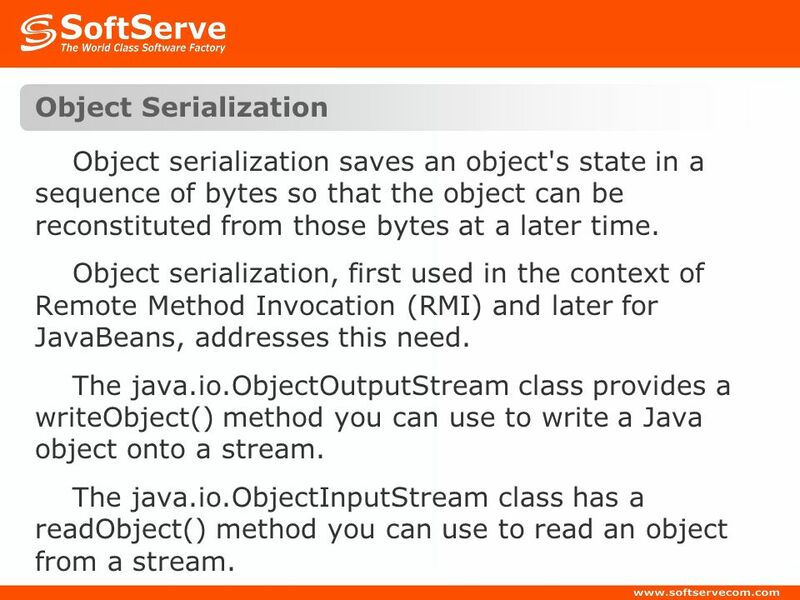 Object serialization, first used in the context of Remote Method Invocation (RMI) and later for JavaBeans, addresses this need. 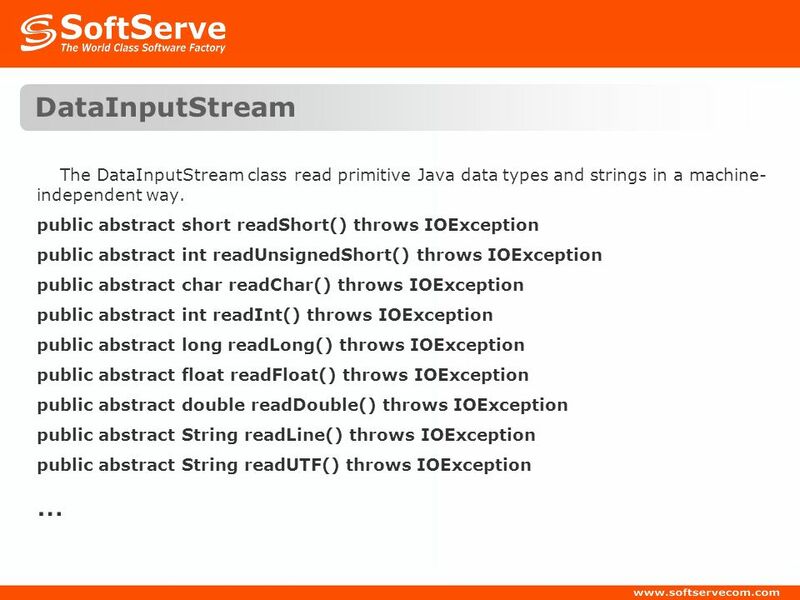 The java.io.ObjectOutputStream class provides a writeObject() method you can use to write a Java object onto a stream. The java.io.ObjectInputStream class has a readObject() method you can use to read an object from a stream. 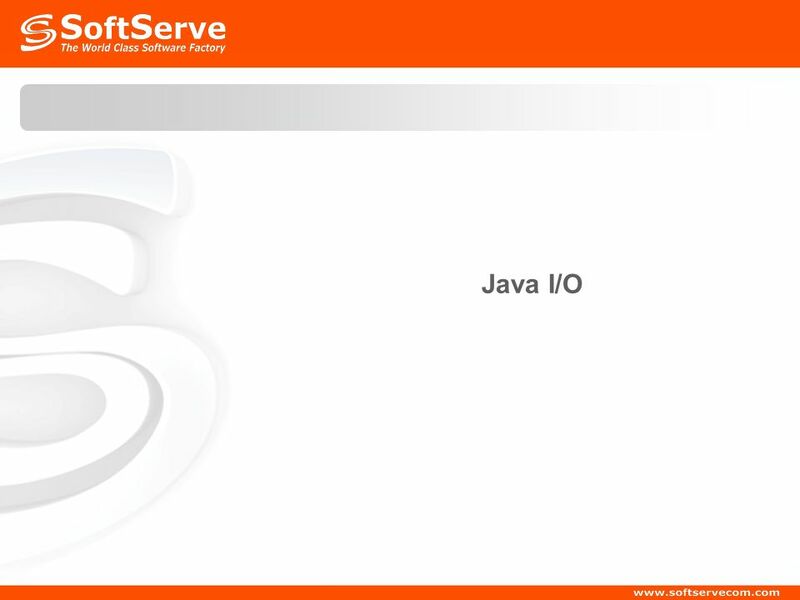 Socket Programming ENTERPRISE JAVA. 2 Content  Sockets  Streams  Threads  Readings. Java I/O and Java Networking (Client Side) Yoshi. Algorithm Programming I/O via Java Streams Bar-Ilan University תשס"ח by Moshe Fresko. Chapter 15: Input and Output F Stream Classes F Processing External Files F Data Streams F Print Streams F Buffered Streams F Parsing Text Files F Random.